Treatment with a new pill containing low doses of 3 antihypertensive drugs in patients with mild to moderate hypertension (high blood pressure) led to an increased proportion of patients (70%) reaching their blood pressure (BP) targets versus usual care (55%). Findings of the study, published in the journal JAMA could transform the way high blood pressure is treated around the world. Ruth Webster, The George Institute for Global Health, University of New South Wales, Sydney, Australia, and colleagues conducted the study to assess whether a low-dose triple combination antihypertensive medication would achieve better BP control vs usual care. The researchers found that 70 per cent of patients with mild-to-moderate high blood pressure who were given the “Triple Pill” reached their target blood pressure goal of 140/90 or less within six months, compared with 55 per cent of people who were taking one or two separate blood pressure medications. Considering the fact that the high blood pressure is the leading cause of disease burden worldwide, it’s expected the findings will change guidelines globally. “It’s estimated more than a billion people globally suffer from high blood pressure with the vast majority having poorly controlled blood pressure. Our results could help millions of people globally reduce their blood pressure and reduce their risk of heart attack or stroke,” said Dr. Webster. 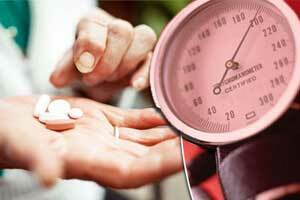 The researchers tested an entirely new way of treating hypertension by giving patients three drugs, each at half dose, in a single pill for the early treatment of high blood pressure. Traditionally patients begin treatment with one drug at a very low dose, which is increased over time with additional drugs added and increased in dosage to try to reach the target. The trial, which was conducted in Sri Lanka, enrolled 700 patients with an average age of 56 and blood pressure of 154/90 mm Hg. Patients were randomly assigned to receive either the combination pill or usual care – their doctor’s choice of blood pressure lowering medication. The Triple Pill, consisted of the blood pressure medications telmisartan (20 mg), amlodipine (2.5 mg), and chlorthalidone (12.5 mg). The triple combination pill increased the proportion achieving target BP of 140/90 or less vs usual care at 6 months (70% vs 55%, respectively). Mean systolic/diastolic BP at 6 months was 125/76 mm Hg for the triple combination pill vs 134/81 mm Hg for usual care. Overall, 419 adverse events were reported in 255 patients (38.1% for triple combination pill vs 34.8% for usual care) with the most common being musculoskeletal pain (6.0% and 8.0%, respectively) and dizziness, presyncope, or syncope (5.2% and 2.8%). There were no significant between-group differences in the proportion of patient withdrawal from BP-lowering therapy due to adverse events (6.6% for triple combination pill vs 6.8% for usual care). Professor Anushka Patel, Principal Investigator of the trial and Chief Scientist at The George Institute, said this was a big improvement. “The World Heart Federation has set an ambitious goal that by 2025 there will be a 25 percent reduction in blood pressure levels globally. The Triple Pill could be a low-cost way of helping countries around the world to meet this target. “Among patients with high BP, treatment with a pill containing low doses of 3 antihypertensive drugs led to an increased proportion of patients achieving their target BP goal vs usual care. Use of such medication as initial therapy or to replace monotherapy may be an effective way to improve BP control,” concluded the authors.